Over the years, we have been able to test different sharpening systems, from electric to stones of various types (with or without guides), and we have rarely found a combination of precision, efficiency, versatility and repeatability of sharpening, as with the Wicked Edge. 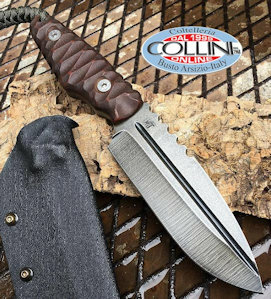 Knife fans, as well as collectors, know how stressful it can be having to sharpen a valued knife, with the fear of ruining the edge or the eventual blade surface finish. With the Wicked Edge, many of these problems have been effectively solved. The system has been designed in such a way as to to allow a surprisingly homogeneous razor sharpening over the entire length of the blade, and is extremely versatile by allowing t the sharpening angle to be adjusted, moreover it is possible to use it on knives of various lengths and blade thicknesses. In many cases the knife after being sharpened with this system, get to cut better than it originally made just out from the package. The available tools, that can be purchased from the official website of the company, covers a wide range of sharpeners - from a transportable version right up to the professional ones; in the Pro-Packages line there are the Pro-Pack I and Pro-Pack II. For those who have taken the first step by buying the basic version, it is also possible to buy the upgrade kit to Pro-Pack II. Let's see in detail how Pro-Pack I with upgrade to Pro-Pack II is made and how the product works. The sharpener is constituted from a heavy platform, in our case made with the Paperstone material (chocolate brown color), but also available in granite, on which is fixed the whole system. The latter is formed by an aluminum support (called base on WE instructions) on which are screwed the various components: the base rod with variable angle adjustment from 13 to 35 degrees on each side of the knife (26 to 70 degrees inclusive), the Ball Joint Assemblies , the Vise Jaw with the Riser of Pro-PackII on which are positioned the knives. Everything you need to mount the instrument is used with an allen wrench of two sizes (the Vise Key), customised with a comfortable grip. It is supplied and elegantly integrated into the aluminium support. The Pro-Pack I includes 100, 200, 400 and 600 grit diamond stones, and Extra Fine 800 Grit / Ultra Fine 1000 Grit Diamond Stones. To complete the razor like sharpening 5/3.5 µm Diamond pastes and Leather Strops are provided. The blade, with the cutting edge facing upwards, is blocked, via two allen screws, in a small triangular grip (the Vise Jaw) made of aluminium (which therefore does not damage in any way the possible finishing of the blade). The knife must be positioned with the back in contact with the supplied Depth key, which, using the appropriate ruler, will also enable you to take note of the positioning of the blade in such a way as to be able in the future to repeat the same sharpening for each knife. Detailed instructions are provided on how to proceed for the proper blade position on the Vise Jaw and for the choice of the sharpening angle: in the absence of the Digital Angle Gauge (bundled with the full version of Pro-Pack II), it is possible to proceed by colouring the cutting edge with a marker and, verifying how the colouring is removed from the stone with a few steps, one can easily understand how it is necessary to move the blade in such a way so as to obtain the correct sharpening position (for both the angle and blade length). The sharpening is made by fitting the stones (starting with the coarse-grained up to the finer) into the guide rails positioned on the base rod, and sliding the stones on the cutting edge alternately left and right, starting from the blade heel to the tip. Of course, as with everything, at the beginning it is necessary to have a little practice, so it would be best to start with the old kitchen knives, but the simplicity of the system is such as to enable you to get great results right away. The sharpness that you get with the Wicked Edge is nothing short of amazing; after performing the steps with finer grain stones you get a perfectly polished cutting edge, without machining marks, and a razor sharp blade made in a workmanlike manner with cutting skills that are difficult to obtain with other similar tools. Among the advantages of this system, in addition to its sharpening results, we must also consider its versatility; it is possible to sharpen sports blades with a thickness greater than 4 mm (which is not possible with every kind of sharpening tool, such as those made with thin guides) and of various lengths (with some special techniques we were able to sharpen knives 40 cm in length). It is possible to take note of how you have positioned each knife, making a list of your blades, thanks to the references provided with the Alignment Guide that allow you to replicate at all times the same sharpness. On the official website of the company there is also a database where each user can enter the reference values that he has used to sharpen his knives (indicating knife brand and model, the sharpening angle and the corresponding letter of Alignment Guide), and share this information with all Wicked Edge users. It should be emphasised that the official website is full of information and the assistance service is exemplary. The limits of this product are mostly related to the extreme measures of the knives, in which the reduced angles of the cutting edge (in the case of very thin knives) or the positioning of the blade on the support (in the case of very long and heavy knives, or for knives with special shapes - especially the curved blades - or which simply do not have a straight portion of the blade spine, preventing the proper use of the support key), make it difficult to use this tool. To solve the problems associated to sharpening of knives with cutting edge angles less than the limit allowed by the instrument, you can separately purchase an adapter, which is an extension clamp of the Vise Jaw that allows one to reduce the sharpening angle. The other issues can be solved with a bit of imagination, but most of the time you lose the sharpening repeatability because you cannot have references to replicate the unique positioning of the blade. The Wicked Edge products can be purchased directly from the Company's official website; the Pro-Pack I price is 425 $, the upgrade kit to Pro-Pack II is $ 149, while the price of the Pro-Pack II is $ 749. There are also a lot of sharpening stones, strops, and accessories to improve your Wicked Edge system. Overall, this instrument represents a true revolution in the world of knife sharpening; clearly it is not universally perfect, like other similar products on the market, but it allows you to get a great razor like sharpness on a large number of blades (both type and size), not to mention that the creators of Wicked Edge continue to develop and implement new solutions, in order to obtain a more versatile product. The Pro-Pack II Upgrade Kit includes some hardware upgrades and can be installed on any WE100 sharpener including the Gen I and Gen II Basic Kits and the Pro-Pack I.